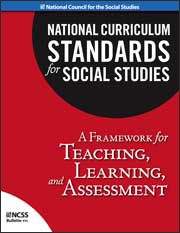 National Council for the Social Studies first published national curriculum standards in 1994. Since then, the social studies standards have been widely and successfully used as a framework for teachers, schools, districts, states, and other nations as a tool for curriculum alignment and development. However, much has changed in the world and in education since these curriculum standards were published. This 2010 revision aims to provide a framework for teaching, learning, and assessment in social studies that includes a sharper articulation of curriculum objectives, and reflects greater consistency across the different sections of the document. It incorporates current research and suggestions for improvement from many experienced practitioners. These revised standards reflect a desire to continue and build upon the expectations established in the original standards for effective social studies in the grades from pre-K through 12. The revised standards, National Curriculum Standards for Social Studies: A Framework for Teaching, Learning, and Assessment, were developed by a Task Force of the National Council for the Social Studies, and approved by the NCSS Board of Directors in March 2010. The remainder of this publication is not available online. See the sidebar at the right of this page for information on how to order the standards. 3. Purposes, Questions for Exploration, Knowledge, Process, and Products. Like the NCSS National Standards, which outline content and concepts for teachers and curriculum developers, the C3 Framework delineates pedagogical approaches and guides states in upgrading their social studies standards. Copies of the standards are $29.95 ($19.95 for NCSS Members), plus shipping and handling.